Please, refer to the updated version: Developer guide: Building a SAMSON Element on Linux. This tutorial shows how to build SAMSON Elements on Linux using QtCreator. 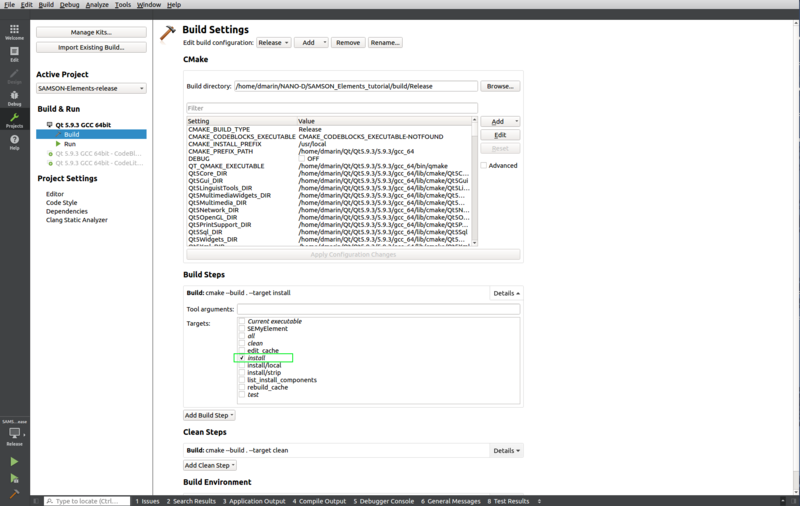 For other IDE, please, check the Main steps to configure a project for your SAMSON Element. This tutorial was done with QtCreator v.4.4.1 and Qt 5.9.3. For an older version, please, check SAMSON School 2017: Introduction and installation of the SAMSON SDK. If you experience any problems with building your SAMSON Element, please let us know on SAMSON-Connect forum. If you have not installed SAMSON SDK, please, follow instructions from Installing the SAMSON SDK. 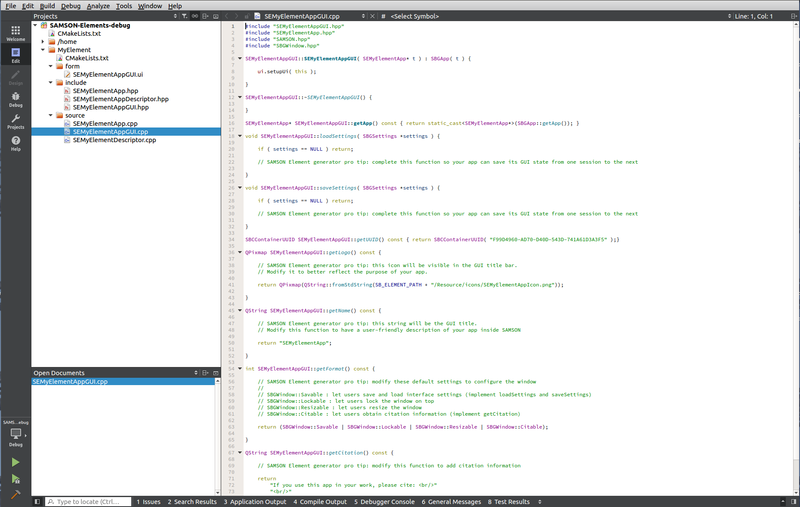 QtCreator (should be available when you install Qt) or another IDE you prefer. QtCreator is necessary if you want to modify Qt forms. Here we list the main steps for configuration of a SAMSON Element project. Application of these steps in QtCreator is described in the sections below. Assume that Qt is installed in YourQtPath (i.e. the folder which contains the Qt5.9.3 folder), SAMSON is installed in YourSAMSONPath/SAMSON/0.7.0 (i.e. the folder which contains the Binaries folder), and the SAMSON SDK is installed in YourSDKPath/SDK/0.7.0/ (i.e. the folder which contains the following sub-folders: cmake, include, libs, SAMSON-Debug). cmake -DSAMSON_SDK_PATH=YourSDKPath/SDK/0.7.0 -G"CodeLite - Unix Makefiles" -DQT5_CMAKE_INCLUDE_DIR=YourQtPath/Qt5.9.3/5.9.3/gcc_64/lib/cmake/ .. Provide a boolean variable named DEBUG and set its value to TRUE (ON) for the Debug build and to FALSE (OFF) for the Release build. If not present, provide a string variable named CMAKE_BUILD_TYPE and set its value to Debug for the Debug build or to Release for the Release build. For both Release and Debug builds, set the install target so that after a successful compilation your SAMSON Element would be installed in a special SAMSON directory to make it available in your SAMSON installation. Note that a SAMSON Element compiled in Release mode will be available only when launching the SAMSON-Core executable provided with SAMSON installation, while a SAMSON Element compiled in Debug mode will be available only when launching the SAMSON-Core executable provided with SAMSON SDK installation. If you have CMake installed QtCreator should generate a kit for it. 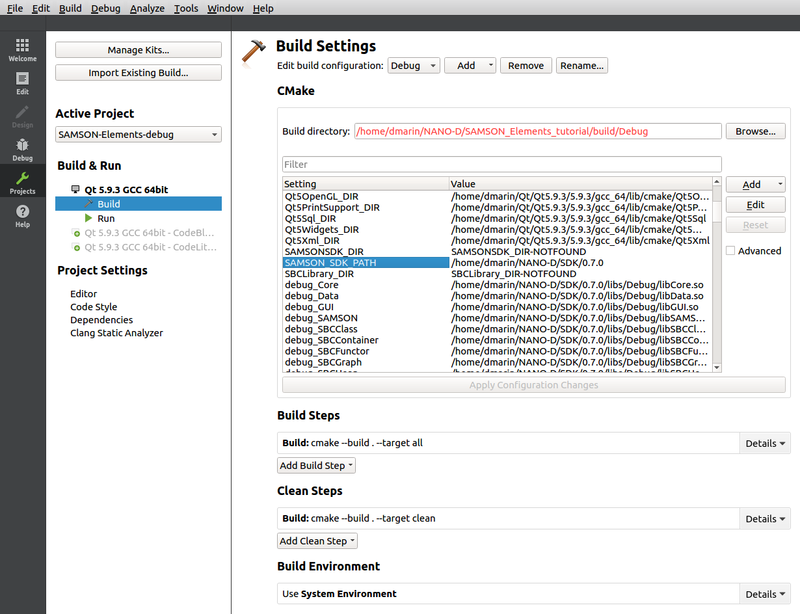 Else, if QtCreator did not detect CMake we refer to Qt tutorial on Setting Up CMake for setting up CMake in QtCreator. Once CMake is installed, generating a project for your development environment is straightforward. 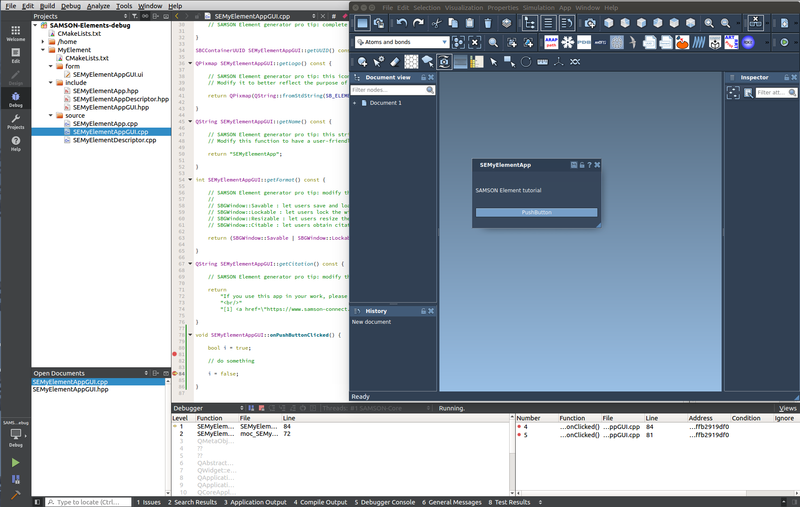 Open QtCreator and click on Open Project. Choose the root CMakeList.txt of your newly generated element (CMakeList.txt from the parent folder to your SAMSON Element, not CMakeList.txt inside the SAMSON Element folder). Choose the Build&Run kit (if necessary, you can configure your kits in Options → Build&Run → Kits), set build folders for Debug and Release, and press the Configure Project button. 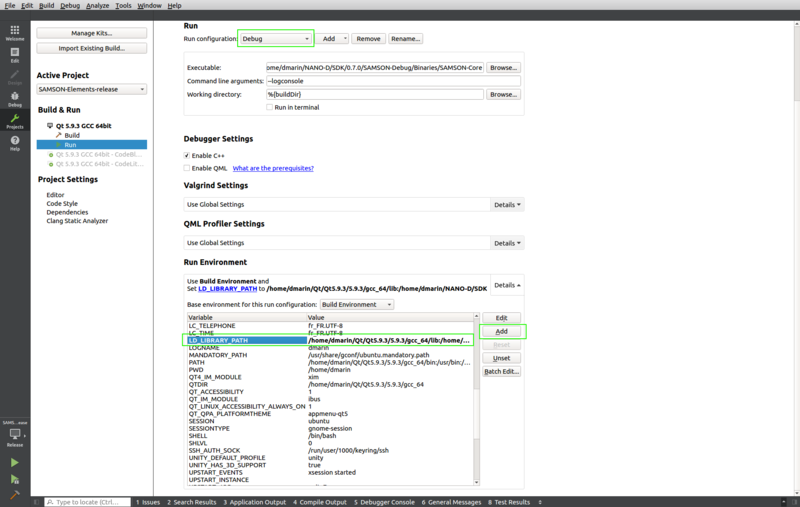 Once you specified the variables for the build, press Apply Configuration Changes and you should see a set of settings variables defined by cmake like on the image below. You may need to add files to (or remove files from) your new SAMSON Element (e.g. to add or remove classes, to wrap existing code, etc.). When you do so, you should run cmake again to regenerate a project for your development environment. One simple way to do this without having to open a command window is to slightly alter the CMakeLists.txt file located in the SEMyElement (e.g. add a whitespace somewhere) and save it: when building the project (see the next section), CMake will detect the changes and update the project. 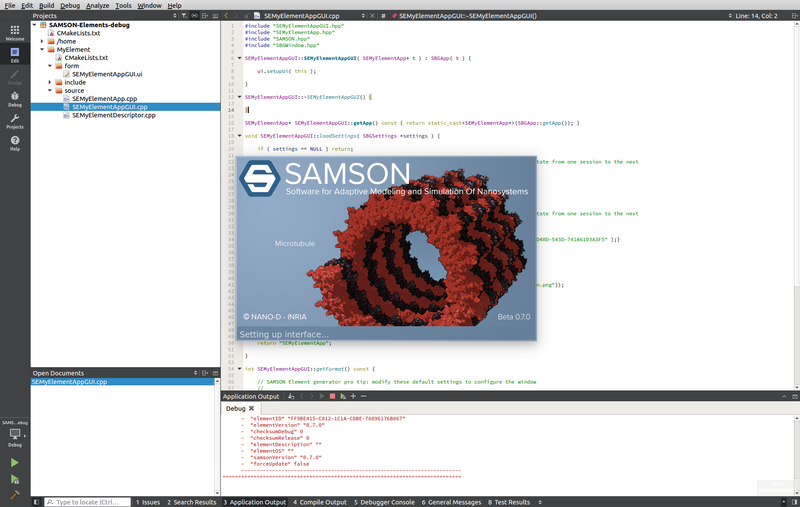 Once your project is created, you can now browse your SAMSON Element files and edit your code. The project contains one target for your SAMSON Element (SEMyElement), as well as some cmake-specific targets. When you generate new SAMSON Elements with the Element Generator in the same folder, cmake will re-generate the project files and will add new targets as needed. You may now check that your code compiles by either building the target corresponding to it (e.g. SEMyElement) or if your solution contains several SAMSON Elements and you want to compile them all at once, by building the build all target. If your element does not compile, you may have to install libstdc++ packages dev and static for 64-bit architecture. To be able to use your SAMSON Element, it should be installed in a specific SAMSON directory to make it available in your SAMSON installation. For making it possible, switch to Projects mode (Ctrl+5) and in the Build Settings for each build configuration (Release and Debug) set in Build Steps target to install as it is shown in the image below. Now you can build the install target (either in Release or Debug configurations) to install your new SAMSON Element (building the install target will automatically build your project). If the build was successful your SAMSON Element should be available when you launch SAMSON (for Release configuration – SAMSON-Core from SAMSON installation, for Debug configuration – SAMSON-Core from the SAMSON SDK installation). During startup, your SAMSON Element will be loaded alongside with the SAMSON Elements you added from SAMSON Connect, as well as other SAMSON Elements you developed. Note that a SAMSON Element compiled in Release mode will be available only when launching the SAMSON-Core executable provided with SAMSON installation, while a SAMSON Element compiled in Debug mode will be available only when launching the SAMSON-Core executable provided with SAMSON SDK installation. SAMSON Users only get the Release configuration, since this is the optimized one. The SAMSON SDK installer, though, adds a Debug version of the SAMSON-Core executable. It is this version that should be started when testing or debugging SAMSON Elements compiled in the Debug configuration. You may also add some command line arguments, like: –logconsole –disablenetwork –import –logfile “file” –logdefaultfile. 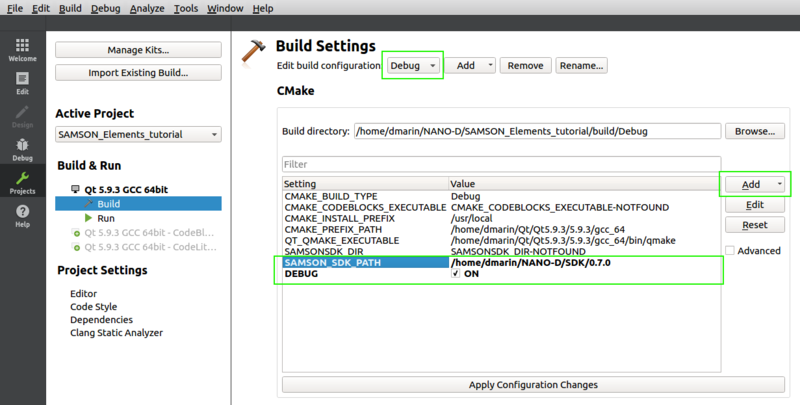 Now when you build the install target (Ctrl+B) and run (Ctrl+R) SAMSON will launch from QtCreator. If you choose Debug build and Debug run you can debug your Element, add breakpoints and inspect variables values.